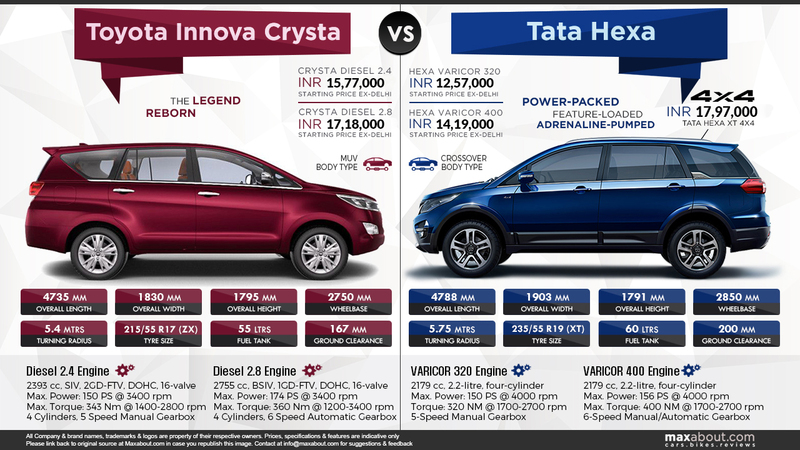 Tata's Hexa is the company's flagship car in India and the features are undoubtedly class leading while its top spec version carries 40 Nm more torque than the nearest rival, Toyota Innova Crysta. Tata Hexa is longer, wider and even much more value for money when compared to the Toyota MPV. It offers 4x4 option on the model that is actually priced around 4 lakhs lower than the top spec Innova Crysta. Not just that, Hexa comes with a 10 speaker audio system from JBL that is specifically made for the car. Toyota Innova Crysta, on the other hand, believes more in the brand image and scores well when it comes to reliability and trust from the customer side. The availability of more BHP in its case makes it swifter on the highways while it uses just front disc brakes for the braking duties. The feature list feels small in front of the Hexa as it uses smaller wheels, lesser wheelbase and even lack of driving modes like it competitor. The price difference between both the cars make Hexa a better option to consider in the premium MPV segment.